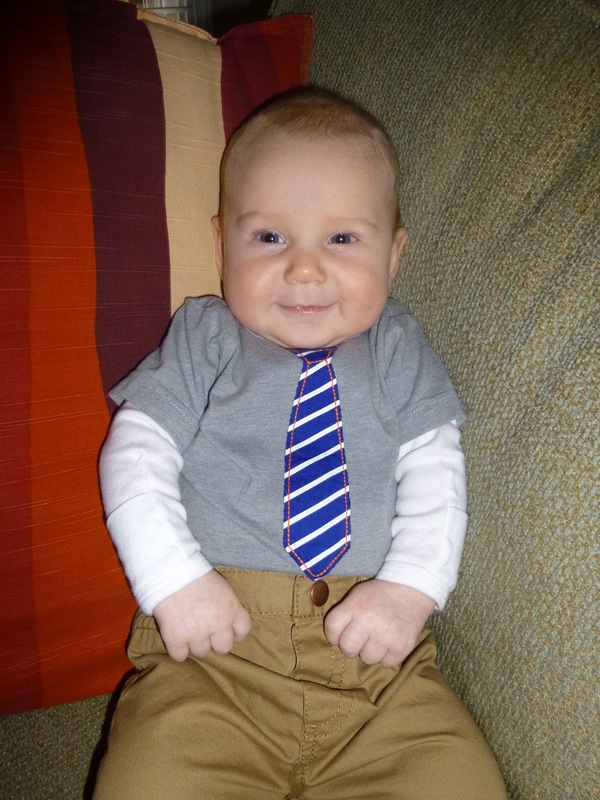 Mr. Jensen is 3 months old today. He is just such a sweetie. 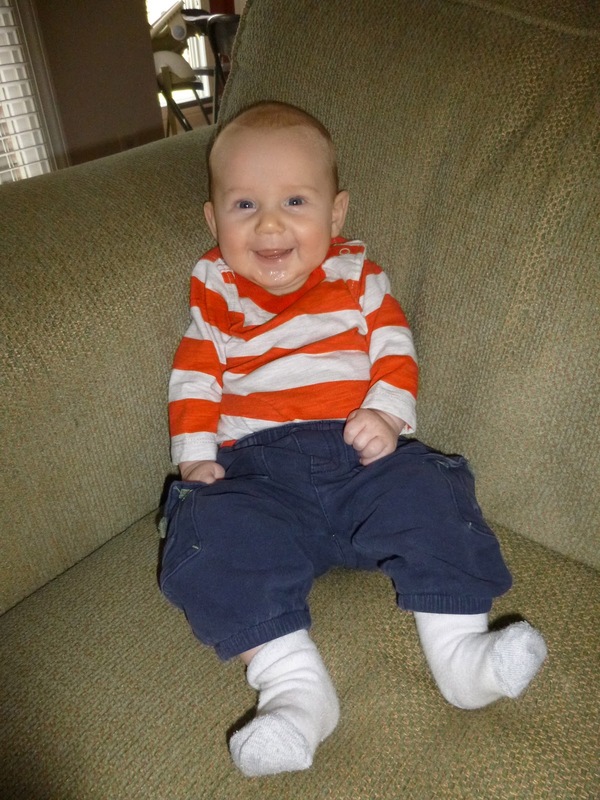 He is wearing size 2 diapers, 3-6 month clothes, and sleeping 12 hours a night. He nurses about every 2 hours during the day, so about 6-7 times. He is still cat napping throughout the day, but usually has one long nap. He is definitely staying up longer and is much more alert. He rode forward in the baby carrier this week and enjoyed seeing everything. He likes to sit up with assistance or stand if he is on someone's lap. 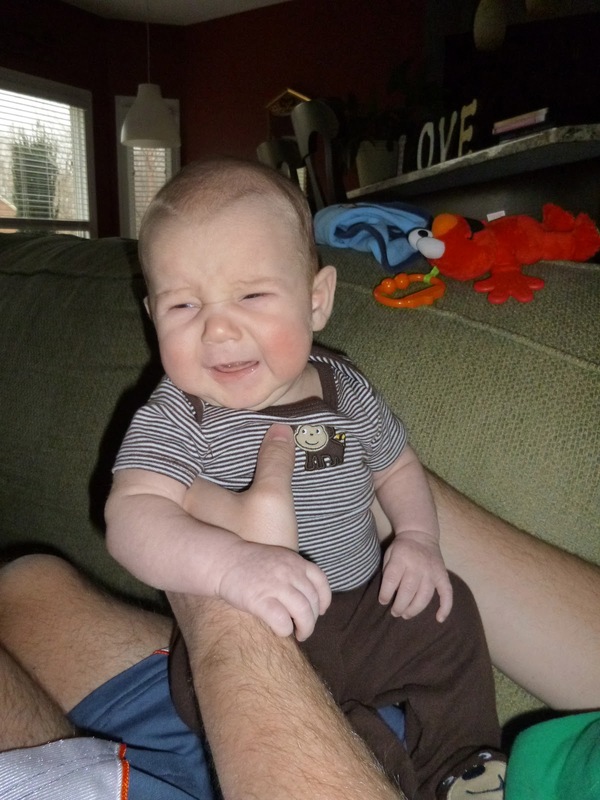 He will swing and sit in the bouncy, but he would rather be held. He also enjoyed the pacifier this week a little more than usual, normally when he is getting tired or in the car. 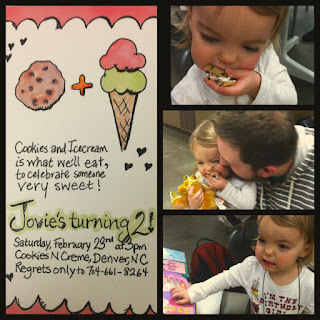 We had Jovie's 2nd birthday party at our local Hershey's ice cream shop, Cookies N Creme. 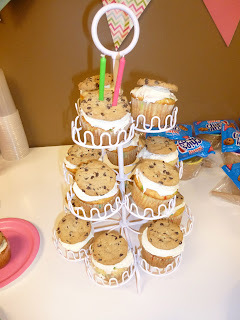 So, the theme for her party was Cookies and Ice Cream. We made our favorite Funfetti cupcakes, iced them, and stuck a chocolate chip cookie on top. I drilled two holes in Jovie's cupcake to stick her two candles in. My sister and I collaborated on the invitation. 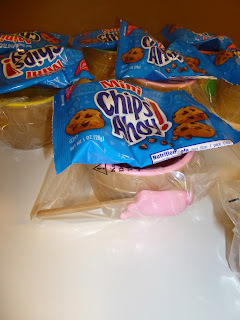 I watercolored the cookie and ice cream cone and she designed the rest. 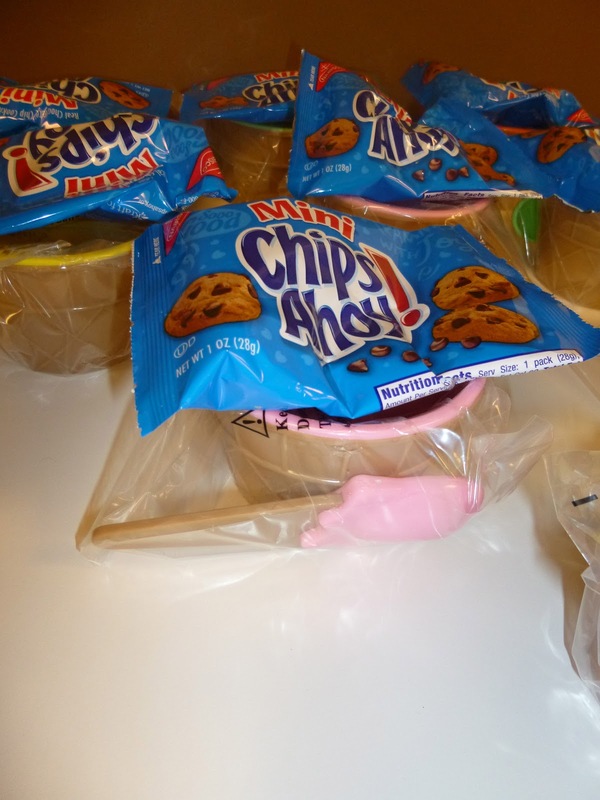 The party favors were a cute plastic ice cream bowl/spoon and a pack of cookies. 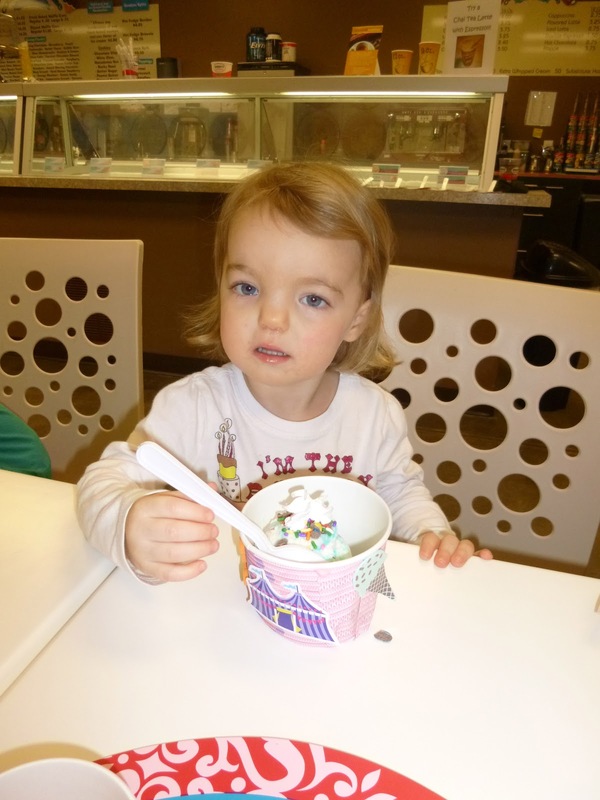 The store has huge white boards on the walls that are probably more fun than the ice cream for the kids. Jovie got to pick three toppings for their ice cream. Bethany and Haven were checking them out. The kids got to go behind the counter to pick out their flavor. That was really fun. Jovie's cup was decorated with her name on it. So cute! Party Attendees were: Beth, Stella, Jake, Izzy, Jonah, Jobe, Mary, Peeps, Meems, Jackie, Lyndsey, and Wendy. Pop and Grammy were out of town. 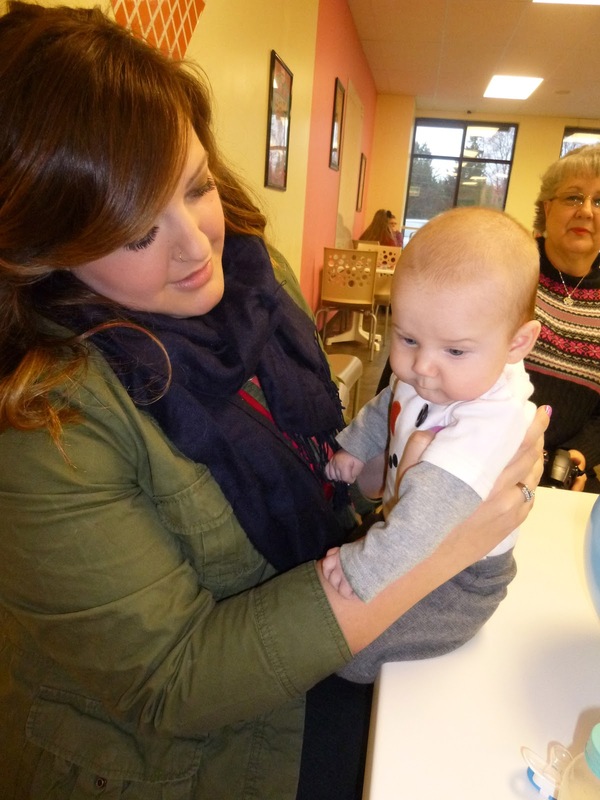 Jensen hung out with Aunt Lyndsey. I'm so thankful my girls got her eyelashes! Jovie got to open so many fun presents! 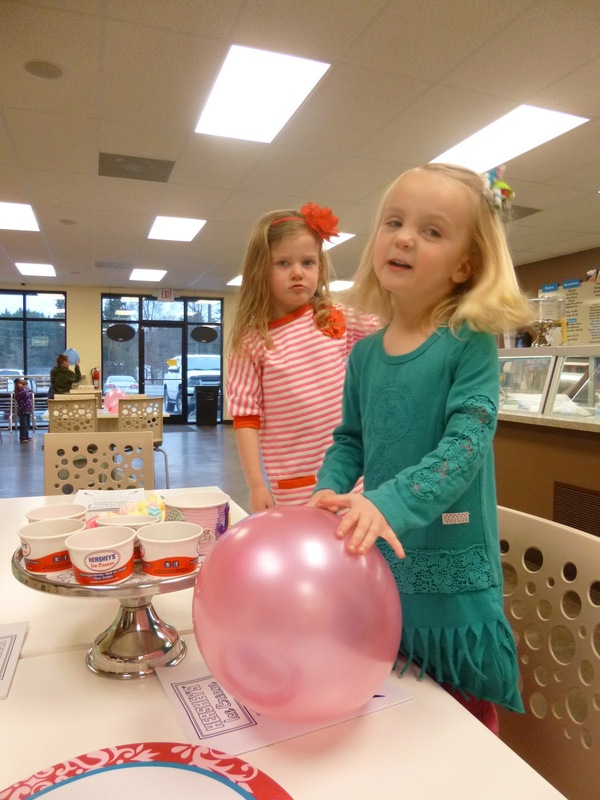 They played a rousing game of pin the cherry on the ice cream. On Sunday morning, Jovie's actual birthday, she ate a #2 waffle. 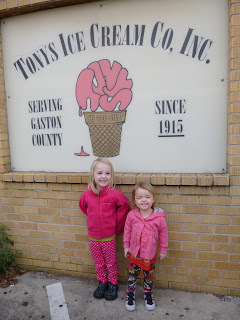 On Monday, we took our third annual trip to Tony's Ice Cream. We definitely have gone or will go more than once a year, but we are going to try to let this be Jovie's special trip every year. Jeremy, Haven, and I ate here right before I went to the hospital, with pretty serious contractions, to deliver Jovie. Jensen enjoyed his first trip! Happy Birthday to the sweetest and messiest two year old we know! Our sweet little Jovie turned 2 today! I can't believe that 2 years ago that gorgeous 4 pounds, 13 ounces baby girl graced us with her presence. She was 4.5 weeks early, but right on time! What a blessing she has been! A full birthday post is coming. Here are a few pictures from Aunt Lyndsey. We bought this white lamp for Jovie's room last year and I knew right away that I would like to do something to it. I guess this is my first Ikea hack- taking an Ikea item and doing something new to it. After sitting in her room for hours over the last year and staring at some of the things on her walls, I decided the lamp shade definitely needed some color. I bought the girls some watercolor paints a while back and I have enjoyed painting with them. So, I took some of the things on Jovie's walls as inspiration and used the the watercolors to paint her lampshade. These pictures were just too cute not to be shared. Twelve week old Jensen dressed up for his cousin Bethany's winter program at preschool. He also fell asleep on the well loved doggy the other night. He looks huge. 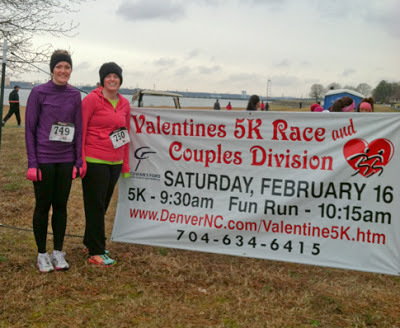 Wendy and I ran the Valentine's 5k in our area on Saturday morning and enjoyed running in a few flakes of snow. I only walked about 3/10 of a mile, so I was really proud of myself. This was my 1st 5k since the same race last year right before I got pregnant with Jensen. Although, my time was super slow, I enjoyed the race and did a lot better than I thought I would. I am so sore! When I got home there were a few more flakes and Haven wasn't impressed. A few hours later we had this. It was beautiful. Jensen didn't really enjoy his first snow. He cried. Jeremy had all the neighborhood kids out playing. He is such a great dad to all the kiddos. 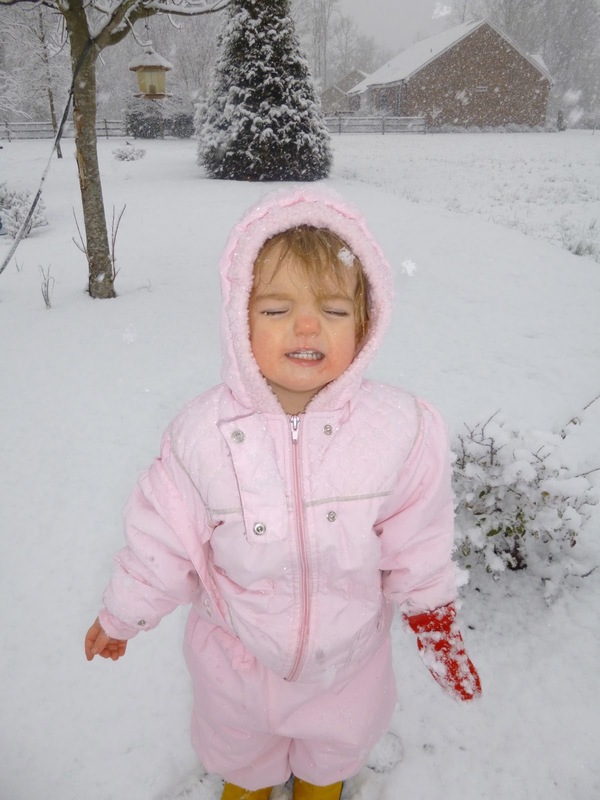 Jovie's first snow! She enjoyed it for a little while, but then wanted to come in to watch Mickey Mouse. 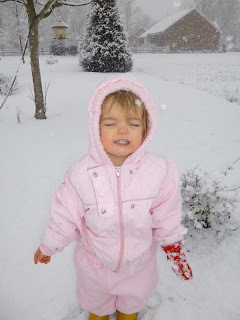 Haven has been waiting all year to do snow angels! There was still enough for them to play on Sunday a little more. We still have a little snow in our shade today, but I think the excitement has worn off. It was beautiful and didn't mess up any of our plans. Just how us southerners like it. We had a sweet day yesterday. Haven woke up super early because she was so excited about her party at school. 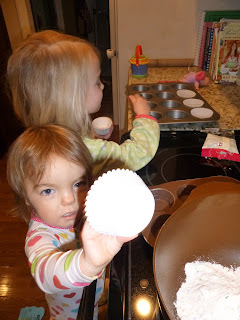 She has been making valentine's crafts for like a month in preparation for yesterday. Jeremy and I got the girls a zoo animal for our zoo toy, fork/spoon set, and reese's pieces heart. I felt lots of love yesterday in our home. Things like- a husband that puts away clean dishes, hugs from kids, a baby that sleeps 10 hours, God loving me through his word and my children. We are so blessed to have these kiddos to love. 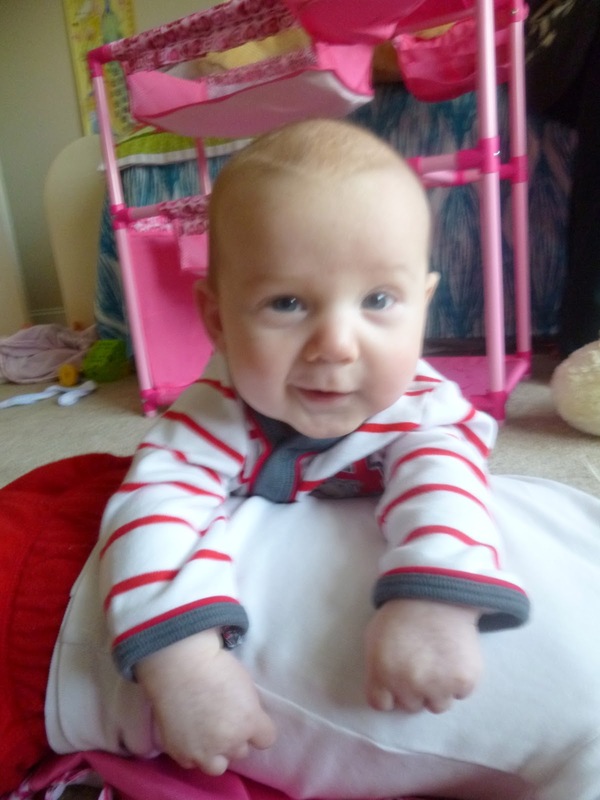 Tummy time on sissy rocks! Sweet Jovie didn't want to take a picture with her siblings. 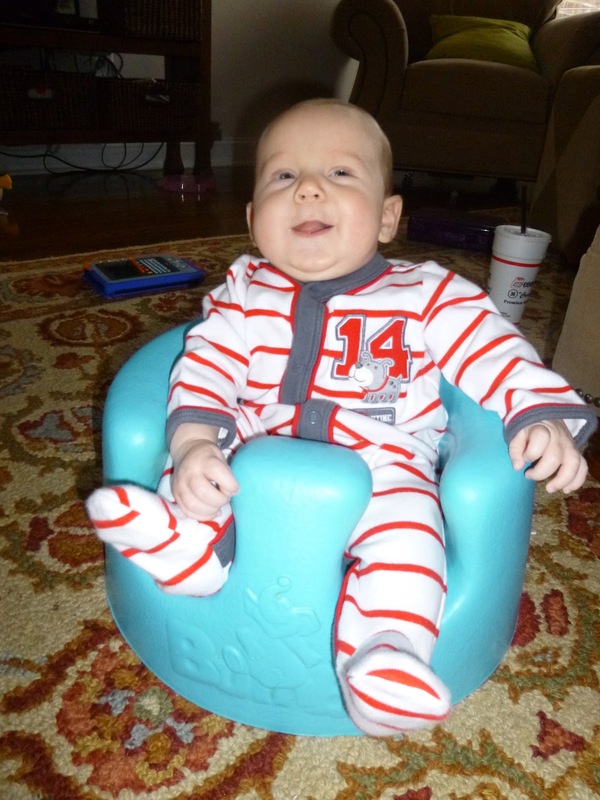 Jensen enjoyed sitting in the bumbo seat for the first time this week. He also has discovered his sweet hands. He is hitting toys and rubbing his hands together. My friend, Bethany, hosted a Favorite Things party Saturday. I had such a good time talking with friends and getting a few new surprises. You take 5 of your favorite things to the party and you come home with your friends' favorite things. I took Grandma's Secret Spot Remover because this is something that I consistently buy. I get it at my local Hancock's Fabrics and it lasts a long time. 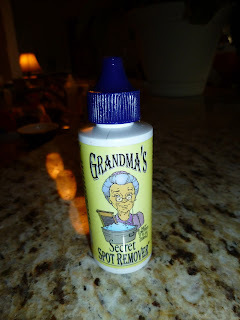 It gets just about anything out that other stain removers don't touch at our house. I came home with some awesome new treats. Soap, dishtowel, cup, kitkat, nail polish, note cards, sticky notes, and brownies. I had a great time and it was a perfect party idea. Thanks Bethany! We have had major highs and major lows this week. LOWS- A stomach bug has been around for over a week. Last Saturday, Jeremy had a rumbly tummy and then on Tuesday Jovie threw up. 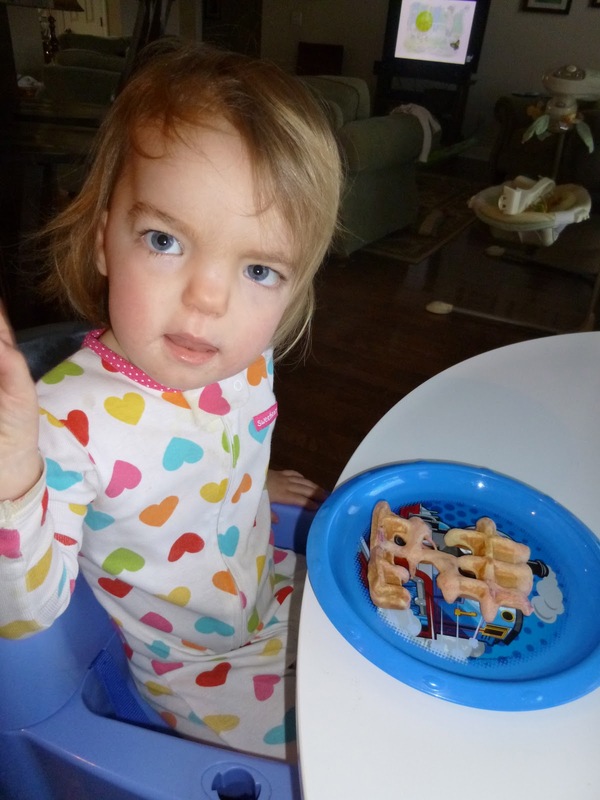 Tuesday night, Haven threw up in her bed and then again after breakfast Wednesday. On Thursday, Haven was a new revived person. The energy she had was amazing. Then she threw up in her bed Thursday night. Jovie had bad diapers yesterday and then threw up in her bed before she even fell asleep last night. Today, my belly is rumbly. I'm just thankful it has been mild and everyone has been fairly happy. We also got some sad news about a person we love very much. We are praying for a quick healing for her. 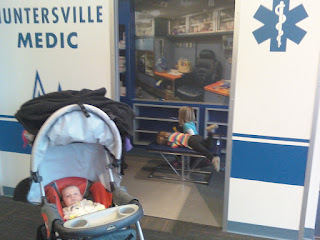 Haven got two shots at her 4 year old doctor's appointment this week. 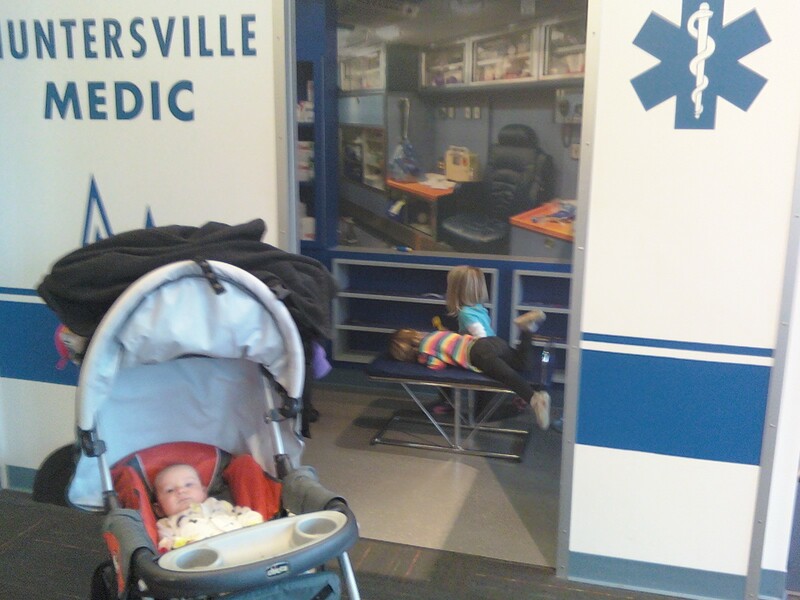 She was very brave, but cried a little. 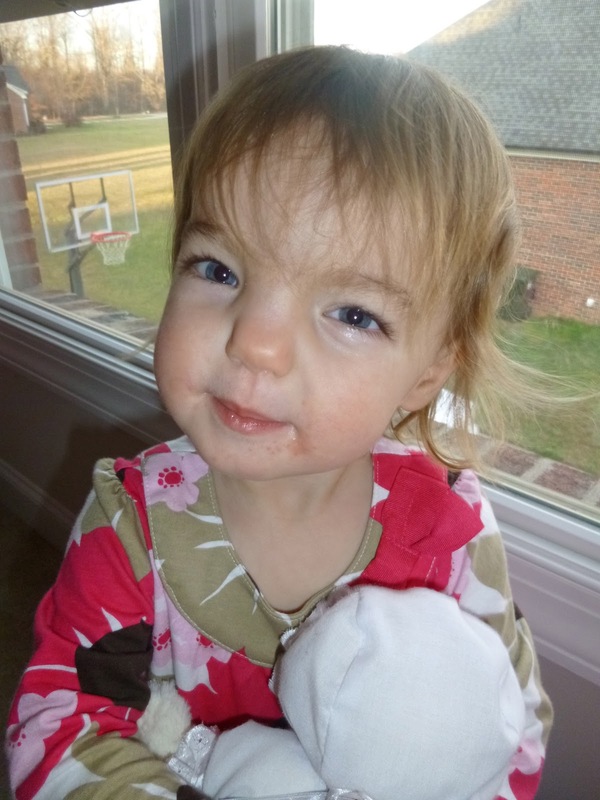 Her and Jovie were in perfect health according to the doctor. Haven is 3'3" and 29.8 lbs. Jovie was 34" and 24 lbs. 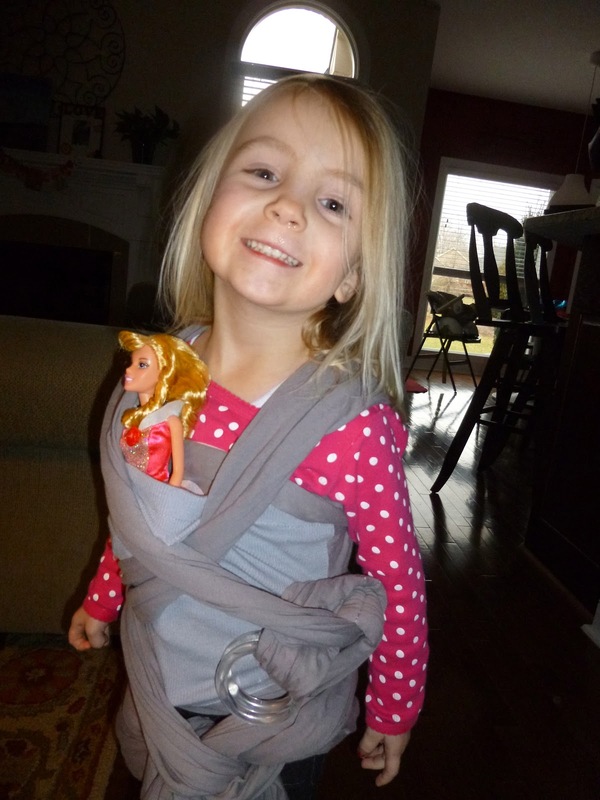 and doing everything that a 2 year old should be doing. HIGHS- I got all three kids to bed before Jeremy got home from band practice Monday night. I was pretty proud of myself. It was the first time! Jeremy was gracious and let me go to the gym 4 times this week. It felt so good! 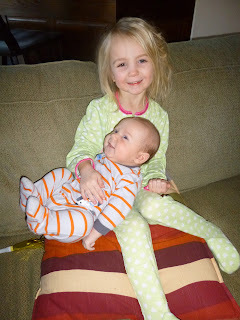 On Thursday, the day everyone seemed in perfect health, the kids and I ran errands. 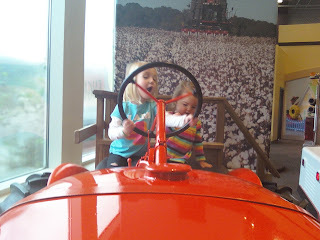 We also went to Discovery Place Kids, lunch, and to Target. This was my first time doing that much with all three kids! We all sat around the table the other night for the first time. Can you see Jensen's little body over beside Jeremy. He seemed to enjoy sitting at the table with us. The girls were so cute sharing this stool the other night. They really do love each other. Jovie is a little momma. She wanted to wear my wrap the other day. 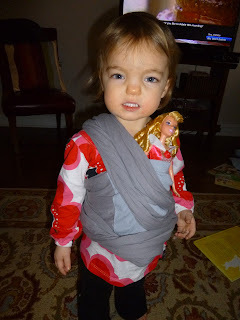 She kind of looks like Rambo. Haven wanted to do it too. Jensen was just making some noise to fit in. The girls love playing on our bed and they really like it when their brother joins them. He still hates baths. He screams the whole time, but he loves people swaddled up in his towel. Jensen's new trick this week. He is levatating. He tries to keep his head up all the time. He doesn't want it laying flat. It is so funny. I'm so thankful that our highs outnumbered our lows this week.